James Monroe Taylor’s tenure as Vassar’s fourth president saw the college expand; the student body more than tripled in size to about 1000, many new buildings were erected, and the curriculum was dramatically altered. During his twenty-eight year presidency, Taylor raised Vassar’s reputation and its standard for academic work and held unwavering loyalty and support from faculty and students. Taylor was born in Brooklyn, New York in 1848. He attended the seminary at Essex, Connecticut, for five years and completed undergraduate work at the University of Rochester in 1868. In 1871 he was ordained as a Baptist minister upon graduating from the Rochester Theological Seminary. Taylor visited Europe for a year in 1873, and according to Haight, his biographer, "[The trip]...progressed along lines of discouragement and happiness, doubt and hope, and throughout the varied months, the prophecy of Taylor's teacher at Essex was fulfilled, for the boy had now been 'made up a man.'". Upon his return from Europe he married Kate Huntington, with whom he had four children. For the next fourteen years, Taylor preached at various Baptist pastorates in Connecticut and Rhode Island. Taylor was chosen as the president of Vassar in 1886. Vassar had experienced some administrative strife before Taylor’s arrival; Samuel Caldwell had resigned in 1885 after a troubled tenure, and J. Ryland Kendrick, a Baptist minister on the Board of Trustees, had been acting as the president. Given a relatively free hand by the Board of Trustees, Taylor set to work on the academic program. He abolished the special student and preparatory division of the school, which raised Vassar’s academic standards. Taylor also broadened the curriculum in the areas of social science, history, economics, political science, sociology, religion, art, and music. Art and music were now in fact recognized as academic departments honoring degrees, not just schools. Taylor also advocated the teaching of science on an experimental, laboratory based system. The Mu chapter of Phi Beta Kappa was established at Vassar (a first for women’s colleges), as part of Taylor’s agenda to strengthen Vassar’s academic reputation. “Endow the college” was Taylor’s motto as president. Under his administration, over one million dollars was raised, and his unremitting public speaking tours solidified Vassar’s reputation. Taylor also worked for the endowment of professors, although the Trustees were more interested in erecting buildings. Many building were indeed erected during Taylor’s tenure, including Strong House, Rockefeller Hall, the library, the president’s home, the chapel, and the Student’s Building. Apart from promoting and administering the college, Taylor also conducted daily chapel and taught psychology, ethics, and philosophy. He also wrote several books on psychology, religion, and Vassar history. Taylor was an immensely popular president. His refusal to the presidency of Brown University in 1899 was met with much celebration on the part of the students and faculty. If Taylor lacked experience in higher education in 1868, he was a veritable expert a few years later; from 1910 to 1914 he served as a member of the Carnegie Foundation, a center for educational policy. Although Taylor was untiring advocate of women's education, his conservatism was beginning to be felt in the early 1900's. According to Henry Noble MacCracken, who succeeded Taylor, Taylor's vision for Vassar graduates were for them "to be cultured but human, not leaders but good wives and mothers, truly liberal in things intellectual but conservative in matters social." MacCracken continued, "Throughout Taylor's term Vassar was a college for women developed by men." The era of Inez Millholland '09 and Julia Lathrop '81, heralds of a new progressive women's movement, was yet to come. 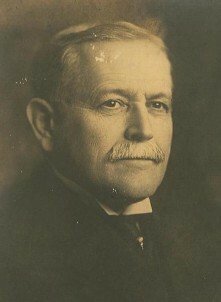 Taylor retired as Vassar’s president in 1914. His demanding schedule and responsibilities surely had an effect on his health; in 1895 and 1905 he took a sabbatical in Europe for a year’s rest. Only two years after his retirement Taylor died of pneumonia. To Vassar he left behind an endowment fund, a library fund, the Taylor Hall of Art, a modern and rigorous curriculum and faculty, an up to date system of residences, and a spirit of educational excellence and idealism. In 1915, President Taylor wrote about Vassar's contributions to American higher education. Bruno, Maryann and Elizabeth A. Daniels. Vassar College. Charleston: Arcadia Publishing, 2001. 35-36. Haight, Elizabeth Hazleton. Life and Letters of James Monroe Taylor; the biography of an educator. New York: E.P. Dutton & Company, 1919. 33-50. “James Monroe Taylor.” Dictionary of American Biography. 1958 ed.